Everything you wanted to know about nuclear technology – Provided by New Scientist. Hans Bethe talking about his shock of seeing the after effects of Hiroshima on Peoples Archive. HYDESim: High-Yield Detonatonation Effects Simulator Another Nuclear weapon simulator with a few more features based on the "The Effects of Nuclear Weapons", ३rd Edition, by Samuel Glasstone and Philip J. Dolan. Effects of Nuclear weapons These tables describe the effects of various nuclear blast sizes. All figures are for १५ माइल/घंटा (२४ किमी/घंटा) winds. Thermal burns represent injuries to an unprotected person. The legend describes the data. "Nuclear Power and Nuclear Weapons: Making the Connections" – an article about the connections between nuclear power and nuclear weapons development by an anti-nuclear group. Nuclear War Survival Skills is a public domain text about civil defense. IPPNW: International Physicians for the Prevention of Nuclear War – Nobel Peace Prize-winning organization with information about the medical consequences of nuclear weapons, war and militarization. Bulletin of the Atomic Scientists – Magazine founded in १९४५ by Manhattan Project scientists. Covers nuclear weapons proliferation and many other global security issues. See this page for comprehensive data on nuclear weapons worldwide. ५० Facts About U.S. Nuclear Weapons – Largest, smallest, number, cost, etc. 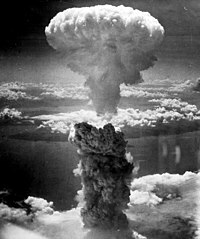 Nuclear Files.org covers the history of nuclear weapons and explores the political, legal and ethical challenges of the Nuclear Age. Union of Concerned Scientists – Nuclear Policy, weapons, testing, technical issues, and arms control.